Family film double feature takes place consecutively on Wednesday and Thursday December 27 and 28 at 1 pm. 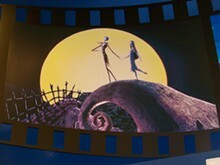 Guests will have two chances to enjoy the classic film The Nightmare Before Christmas the week after the holidays. Learn about stop-motion animation on a tour of the exhibition "Behind the Screen: Tim Burton's Nightmare Before Christmas" and enjoy popcorn and hot cocoa.